Your broker will have all the quotes you’ll need to trade listed online. If you’re an active trader, you’ll have all the free, real-time quotes you need through their online service. The Chicago Board Options Exchange (CBOE) is another source for option quotes. At CBOE.com, you’ll find a free 20-minute delayed screen. For different fee levels, you can get real-time quotes and even real-time streaming quotes. Option volume and open interest are two pieces of options information that are related but markedly different. Volume is a daily record of the session’s trading activity at a particular option call or put strike. Whether a trader is buying or selling an option contract, it counts as part of the day’s option volume. Volume starts every session with a clean slate at zero and increases throughout the day. Open interest, however, is a rolling tally of the total number of option contracts open and active at each strike, representing all options that have not been closed or exercised. The number does not change throughout the day but rather adjusts overnight once trades are tallied, exited positions are closed, and new positions are added. Let’s look at a simple example. Open interest on the Target (TGT) October 60 call is at 1,000 on Monday morning. That day, Trader A buys to open 10 contracts at this strike and Trader B sells to close 30 contracts at this same strike. Volume would be 40 at Monday’s close but when open interest is adjusted early Tuesday, it slips to 980, due to the addition of A’s 10 new contracts but the subtraction of B’s 30. Open interest dropped by a net value of 20 contracts. One complexity with open interest is that it may not change at all (or change only very slightly) despite notable volume. While some chalk this up to day traders, who are entering and exiting positions over the course of the same day, others point out it is likely caused by options changing hands from one trader to another. For example, if Trader B had sold her options directly to a new market participant (Trader C), rather than selling them to close, open interest would have moved to 1,010, as the same option contracts remain on the books, just in different hands. So while B may have exited her position, C came in as a new buyer to buy these same positions, and Trader A still adds his 10 contracts. This can be a confusing process, but a trader (whether beginning or advanced) can learn a lot by watching the daily volume and open interest patterns shift each day. When you’re looking at securities that have options traded on them, you’ll notice the expiration dates and how they change from stock to stock. 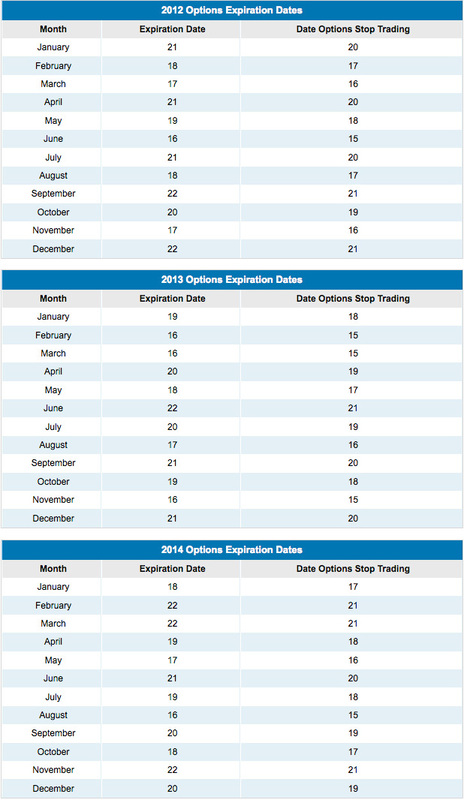 When a security begins to trade options, it’s randomly assigned one of three expiration cycles. That’s because there are so many stocks and securities trading options that it would be very difficult for the option market makers to keep track of every single call and put, at each strike price, for each month of the year. The easiest thing to remember is this rule: There will always be current-month options (the “front-month”), and there always will be options for the very next month. The only exceptions are if a security is delisted. For example, if it’s early May and you want to trade a Netflix (NFLX) option, you’d find May options available (called current, or front-month) as well as options in the June series. One easy way to find out whether an option is available is to look at the options chain, which is available through your broker or on the finance pages at Yahoo! and Google. The options chain provides a list of all the months and prices that are available for a given security. At the top of the chart below you’ll see that, in May, there are options for May, June, July and October 2012, January 2013 and January 2014. One great thing about trading options is that it’s all about making the most of volatility in a relatively short period of time. That means you hold the options only from the trade open date until their expiration date (and sometimes not even until then). 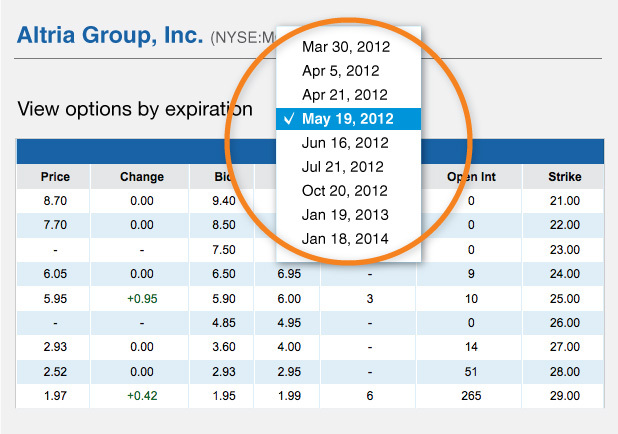 Technically, options on stocks expire on the third Saturday of every month. But because the markets aren’t open then, options actually stop trading the third Friday of each month. So if you own a July option, you have from between the day you purchased the option until the third Friday of July for it to become profitable. On a few occasions, the underlying stock or ETF trades after the market closes on Friday of expiration week, which can cause some action in your option. During the time you own the options contract, you can exercise your right to sell the option, you can choose to buy the underlying stock at the agreed-upon price (e.g., if you purchased a GOOG March 590 call, then you can buy stock for $590 a share, even if the stock is trading at $600, as long as you do so before the third Friday in March, when the options contract expires). Lastly you can choose to do nothing and the option will expire worthless without penalty to you . Below you’ll find charts with the expiration dates for 2012, 2013 and 2014. Remember, because the market is closed on Saturday when the options technically expire, they actually stop trading the Friday before. Article printed from InvestorPlace Media, https://investorplace.com/2012/04/how-to-read-options-quotes/.